Flat UI bootstrap blogger template is my latest addition to bootstrap blogger template collection. 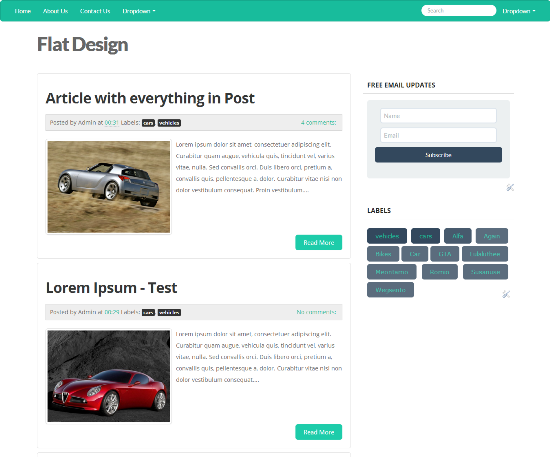 Flat UI blogger template is based on the flat UI that’s currently making big waves in the web design. This blogger template is making use a twitter bootstrap theme from bootswatch. If you need css and less files for this bootstrap theme, get flatly from bootswatch. There is not that much to say about this blogger template. It is a powerful, flexible and customizable theme which will help you to create nice blogger blogs in simple and minimal blogger style. We did plenty of works to make it beautiful and simple as possible. You can easily customize each part of this template without many difficulties but should have basic HTML and css knowledge. You can preview responsiveness of this blogger template by using this tool, or accessing the demo version via a smart phone. Make sure to remove form url with your own. Which you can preview in template. You can easily make use code snippets from bootstrap blogger template to work nicely with flat blogger template as well. Don’t forget to make use of button code generators if you need more buttons for your website. Icons may not work in blogger template which we will give in our upcoming flat blogger template. Any one can download this blogger template with a tweet. Thanks for downloading, we are soon coming with a better version of flat blogger template and a nice WordPress theme. So don’t forget to sign up for email updates to get it earlier. Happy blogging, if have any problems or errors just leave a comment here to solve it as early as we can. And don’t forget to tell about this blogger template to your friends with a share. These Bootstrap themes of yours are so Great, i use one currently with some editing on My Blog, you are doing great considering no one makes good Blogger themes anymore. Happy to hear that you liked bootstrap templates. You made nice customization for your blog and look great. Yeah the Customization is what attracted me to Bootstrap. Happy to hear that you liked it. Thanks for your comment. don’t you have just a plain html/js/css template?